The biggest planet in our Solar System, 318 times more massive than our Earth, mostly composed of hydrogen and helium. But even a giant planet like Jupiter is a long way from starting hydrogen fusion in its core. Only if Jupiter was 70 times more massive would it no longer be a planet any more but a red dwarf star. Red dwarfs are the smallest stars around but are massive enough to initiate nuclear fusion in their core and emit light. Jupiter has at least 67 moons; the biggest one is called Ganymede, it's the largest moon in the Solar System and even bigger than the planet Mercury. Jupiter, Saturn, Uranus and Neptune are called the Gas Giants. But don't imagine these planets as big spheres of gas. Most of the volume is liquid due to the high pressure. So, Jupiter is mainly composed of a liquid ocean of metallic hydrogen and hydrogen in a supercritical fluid phase with a gaseous atmosphere above it. The ocean of liquid metallic hydrogen is a good electrical conductor and creates a strong magnetic field around the planet. Jupiter's magnetic field is 14 times stronger than the magnetic field here on Earth. It is believed that Jupiter has a solid, rocky core of between 12 and 45 times the mass of the Earth. But we are still not sure whether Jupiter really has a solid core or whether the core consists of a thick, hot soup of different elements. In July 2016 the Juno spacecraft will reach Jupiter and – amongst other discoveries – will hopefully reveal this secret. Jupiter radiates more heat into space than it receives from the Sun. How can this be if there is no fusion inside the planet? Jupiter shrinks about 2 cm each year; this contraction converts potential energy into heat (see Kelvin-Helmholtz mechanism). 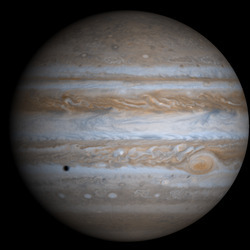 In fact, 4.5 billion years ago Jupiter had twice its current diameter. Because Jupiter rotates very quickly - in less than 10 hours it has revolved once around its axis - the equatorial diameter (142 984 km) is bigger than its polar diameter (133 708 km). This slight egg-shape can be observed even with Earth-based amateur telescopes or - looking closely - on all images of this planet. The other gas giants Saturn, Uranus and Neptune also exhibit this phenomenon to various extents. The famous red spot is a gigantic storm system, fist observed in 1664. It's two to three times larger than our Earth and wind speeds reach more than 600 km/h (or 400 mph), far more than any storm or extreme tornado on Earth. The conditions on the surface of Jupiter may seem hostile, but they are nothing compared to the extreme conditions at the bottom of the liquid ocean, the boundary with the solid core. Here the pressure reaches 40 million bar, causing temperatures to increase to an unpleasant 36000 K. By the way: with temperatures this high a liquid and a solid phase can only be present due to the enormous pressures! It's similar here on Earth: our planet has a solid iron-nickel inner core with a temperature of 5700 K, well above the melting point (1811 K) and even the boiling point (3134 K) of iron at a pressure of 1 bar. But high pressures increase both the melting and the boiling point to much higher values. You can observe this effect on the phase diagram of iron. We are afraid it will be absolutely impossible for mankind to ever explore the bottom of this ocean! Even an expedition to the centre of Earth with its ‘moderate' 3.6 million bar and 5700 K will only be possible in our fantasy.